Every year in the second week of June, the Yamaha Custom Group Europe organizes an international rally for Yamaha cruisers and V-twin engine Yamaha motorcycles. The organization of this rally is done by one one of the YCG Europe members. The Yamaha Custom Club Sweden will be your host this year. The rally site is situated on Lund Farm Camping, Köpingsvik, Öland. Cabins are available and will cost you a little extra. 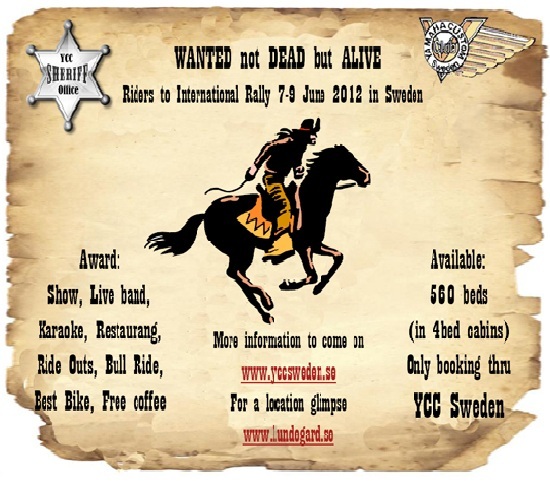 The international YCG Europe rally 2013 will be in Finland.